Paul Hemming has fused his passion for music, art and co-working, emerging as one of Silicone Valley’s most interesting entrepreneurs. Silicone Valley entrepreneur Paul Hemming probably doesn’t sleep much. He’s one of those hands-on guys that always seems to have too many projects in the works for any one person to handle, but handle them he does, and with vigor. He currently owns and operates Temple Nightclub, Mirus Gallery, and a forward thinking co-working space called ECO-SYSTM in San Francisco. We got a chance to shoot him over some questions and find out what makes him tick. Tell us a little bit about how you got started as an entrepreneur. What drew you to the craziness of it all? When I was younger, my parents owned their own business, and I learned entrepreneurial and managerial skills from them, eventually realizing that I wanted to work for myself. When I opened my record store in Oakland in 2001, I was able to be creative in my business decisions and apply a unique approach to combine industries that had previously been uninvolved with each other, and it grew from there. San Francisco’s music and club scene was legendary in the ’90s because of major outfits like Funky Tekno Tribe, Spundae, Wicked Crew, etc. Why do you think the scene dropped off in such a big way? I don’t know that the music scene dropped off as much as it evolved – music comes and goes all the time. Actually, one of the guys from Funky Tekno Tribe works for me now, so it’s all come very full circle with the music scene in the Bay. As music is born and evolves into different scenes, it’s becoming more globalized, which in a way has replaced the local scenes. Tell us a little bit about the idea behind Temple Nightclub and why you think it’s been so successful? 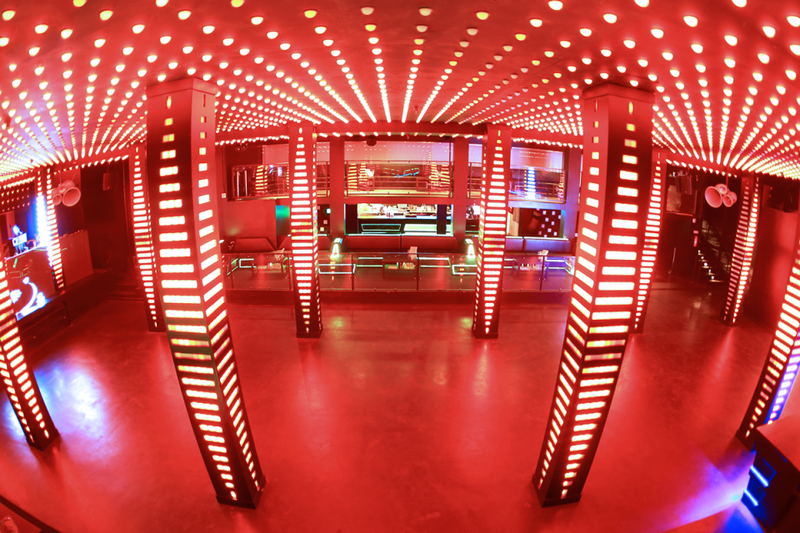 Temple has been around for eight years now, and the idea behind the new Temple has been about learning from the past, growing and evolving through the years – incorporating new technologies and a successful approach to the nightclub design. Channeling the practices of successful nightclubs in Las Vegas, we’ve learned to incorporate the VIP components. A combination of high production values, our state-of-the-art lighting system, and theatricality have all contributed to Temple’s world-class talent. The co-working space is exploding nationwide. Tell us how ECO-SYSTM is different and what are your future plans for the brand? Co-working is definitely exploding – ECO-SYSTM is different because it’s embedded into our building along with facets of other industries. Having both daytime and nighttime components of the building, as well as an art gallery presence, has allowed ECO-SYSTM to be a multi-use space. We’re able to provide unique amenities, have an endless supply of creative outlets, and are able to utilize community gatherings and meetups, creating a very inspiring atmosphere to work in. With our focus on music and entertainment in the incubator, we’re encouraging the crossover of many different industries. We’re currently looking to expand into Denver and Seattle and have both venues open simultaneously. Do you think San Francisco has lost a little bit of its character with all the tech money moving in and driving out young, creative types? I don’t believe that San Francisco has lost character – the city is still incredibly vibrant and diverse. With the Bay constantly evolving and transforming, there will always be a population of young, creative types. Who are some of your favorite artists in electronic music? I like a range of artists – and there’s so many to pick from. Recently, I’ve been working with the nu disco and deep house genres. We’ve just launched our exclusive “Infinity” inside Temple to focus on these styles of music, which is also what I’m personally playing as a DJ these days. What are your thoughts on the current state of the music business? Is there any hope for indie labels? I think it’s an exciting time for music with all the new emerging technologies. There will always be a demand for every style of music, and it’s easier for new artists to be identified with all of the social media and promotional tools and apps available. What do you love the most about being an entrepreneur and what do you hate the most? I love that I’m the creator of my own destiny – that I get to wake up every day and live my dreams and decide where to take this company. I don’t think there’s anything I hate about it – I’m happy that my goals and hard work have culminated into a successful and rewarding business model, both professionally and personally. With all of the evolution and transformations, we’re finally ready to expand, and I’ve formed a new parent company called Nu Future, which will expand our brand around the world.